HOK has achieved planning consent from Glasgow City Council for a centrepiece 17,000-sq.m. Research Hub on the University of Glasgow’s Gilmorehill Campus. Construction on the building is now underway. HOK designed the innovative £113-million facility specifically to foster interdisciplinary collaboration between the University’s four colleges as well as the private sector. Housing 600 academic and student researchers from the colleges of Social Sciences, Arts, Science & Engineering and Medical/Veterinary & Life Sciences, the Research Hub will further the University’s mission of encouraging cross-sector collaboration, research and communication by creating a flexible environment that promotes interaction and lateral thinking. The Research Hub will support engagement among students, industries, policy makers and the public and play a key role in redefining the University’s relations with the business community and its contributions to the city of Glasgow and the wider economy. Construction on the Research Hub marks the start of building work on the former Western Infirmary site in the city’s West End, through the University’s £1 billion campus development programme. Ann Allen, Director of Estates & Buildings at the University of Glasgow said: “We are delighted to receive planning consent for the Research Hub. The Research Hub is a key part of the University’s £1bn campus development and with this building the University is seeking to establish a new and unique facility where the focus will be on interdisciplinary collaborative research. 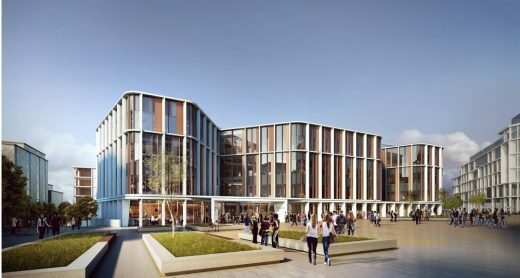 Taking inspiration from the existing University campus, the Gilmorehill Campus Masterplan and surrounding historic buildings, the Hub will form the west side of a new square within the school’s expanded campus. The design features a glass facade with varied terra-cotta panels and fins set within a cast stone frame. The colour palette recalls the surrounding neighbourhood while articulating a distinctive personality. The design reinforces the University’s belief in transparency and community by incorporating a public route through the Research Hub’s entry level that physically and symbolically connects the new University square to its neighbours to the west. Glass curtain walls will display its internal activities to the outside world, reiterating its openness and providing a window into the ongoing research. The Research Hub will include a mixture of social, structured and informal meeting and write-up spaces in addition to flexible lab and research space designed to provide for a range of interdisciplinary research and collaborative activities. 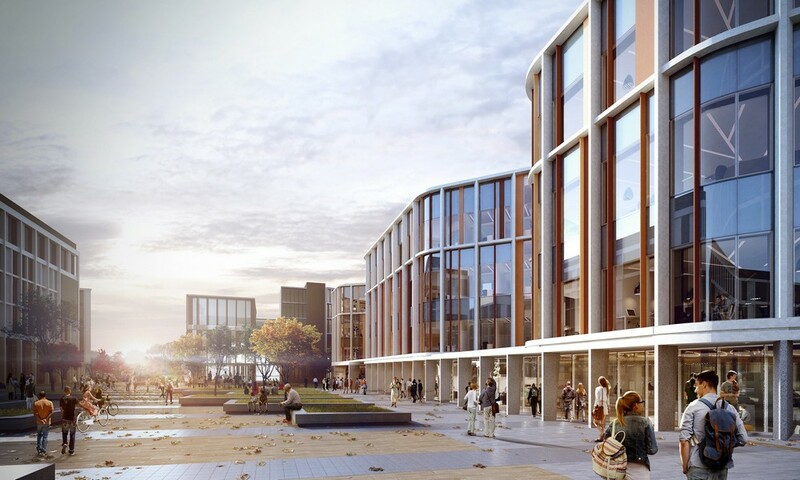 It will be located on land released from the expansion to Glasgow’s Western Infirmary and situated alongside a new Innovation Zone and the relocated Adam Smith Business School. HOK is providing design consultancy services for the project with WSP providing engineering services and Ironside Farrar serving as planning consultant. With offices around the globe, HOK designs buildings and spaces that respond to the needs of people and the environment. HOK designers are rooted in technical excellence, driven by imagination and focused on a solitary goal: to deliver solutions that inspire clients and communities.